The single, most important thing that we can do to support our immunity and prevent disease is to eat a balanced, whole foods diet. For most people, this means eating more fruits, vegetables, beans, nuts and whole grains. These foods contain literally thousands of named and unnamed compounds that influence the composition of all of our body’s cells and enhance cell-to-cell communication. Some of these compounds reduce inflammation and some detoxify the body. Other compounds make it easier for nutrients to pass in and out of cells, while still others activate the enzymes that block uncontrolled cell division (as in cancer cells). Most of these foods are also great sources of compounds called “antioxidants” that protect our cells from attack by neutralizing harmful molecules called free radicals that have been implicated in causing cancer, heart disease, stroke, and other ills. Of course, many factors contribute to the development of these ills, including poor eating habits, but it is now believed that a high-fat, high-calorie diet is as harmful as smoking is, in the development of cancer, triggering up to 75% of colorectal and 50% of breast cancer cases. Numerous studies have now made clear that the more fruits and vegetables you consume, the lower your risk of disease will be. 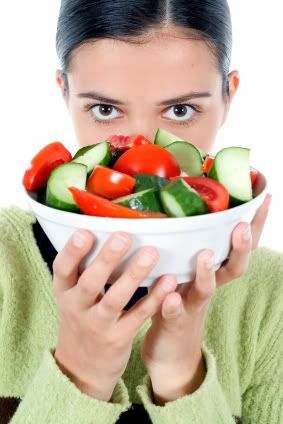 Eating the minimum of five servings of fruits and vegetables daily can lower your cancer risk by 20%. Eating more than five servings will benefit you more still. It is believed that nutrients are better absorbed from food than from pills and that foods work synergistically—their health benefits being greater when eaten together than when the foods are eaten separately. Perhaps supplements can never replicate the benefits of a healthful, varied diet. Of course, absorption of any nutrients depends first upon good digestion. This diet should be modified to meet your personal dietary needs. See your clinician for further information regarding nutrition and your individual medical condition. • Phyto-Cocktail: Place in a blender 2 cups frozen blueberries, 1 cup silken tofu, 1 cup calcium enriched soy milk or nonfat milk, 1 tablespoon honey, 1 tablespoon ground flaxseed, ¼ teaspoon grated lemon zest. Puree. • Broccoli-Stuffed Baked Potato: In a small nonstick skillet heat 1 teaspoon olive oil. Add 1/8 teaspoon red pepper flakes. Cook for 1 minute. Add 1-1/2 cups broccoli and ½ cup chicken broth, cover. Simmer until tender-crisp. Cut 1 baked potato in half lengthwise. Scoop out pulp, leaving skin intact. Mash and combine with broccoli mixture, ¼ cup plain nonfat yogurt and 2 teaspoons grated Parmesan. Refill skins. Bake 30 minutes at 350 F.
• Crunchy Salad: In a medium bowl, combine 1 cup cauliflower florets, ¼ cup grape tomatoes, 2 tablespoons diced red bell pepper, 1 tablespoon finely chopped cilantro and 1 scallion. Add 1 tablespoon lemon juice mixed with 2 teaspoons olive oil. Salt to taste. • Fish in Wine Sauce: Place a 5-ounce mackerel or tuna fillet on a 12-inch piece of foil. Top with 1 tomato, chopped; 1 red pepper, sliced; 1 tablespoon white wine; 2 teaspoons fresh tarragon, chopped. Season with salt and pepper. Top with a lemon slice. Fold the foil into a pouch to enclose the fish. Bake at 475 F for 10 minutes or until the fish flakes easily. • Strawberry Shortcake: Top 1 piece angel food cake with ½ cup nonfat yogurt, flavored with 1 teaspoon vanilla extract and 1 tablespoon honey, and ½ cup sliced strawberries. • French Toast: In a blender, puree ¼ cup silken tofu and combine with ¼ cup calcium-enriched vanilla soy milk or nonfat milk. Add 1/8 teaspoon ground cinnamon and 1/8 teaspoon ginger. Heat a nonstick skillet coated with cooking spray over medium-high heat. Dip 2 pieces whole-grain bread in mixture, soaking both sides. Cook in skillet until browned on both sides, about 5 minutes. Drizzle with honey. • Shiitake Chicken: In a medium nonstick skillet coated with cooking spray, brown 4 ounces of boneless, skinless chicken breast, cut into 1-inch strips, seasoned with salt and pepper. Add 1 cup sliced fresh shiitake mushrooms, ¼ teaspoon dried thyme, 2 teaspoons olive oil and a pinch of salt. Stir, browning for 5 minutes. Add 2 tablespoons red wine to skillet. Simmer 2-3 minutes. • Gazpacho: In a food processor or blender, finely chop 1 scallion, ½ red bell pepper, ¼ cucumber, 1 teaspoon minced basil, and 1 teaspoon snipped dill. Mix with 2 cups spicy vegetable juice, 1 teaspoon olive oil, and 1 tablespoon red wine vinegar. • Cherries Jubilee: In a blender, puree 1 cup frozen cherries, 1 cup calcium-enriched vanilla soy milk, 1 tablespoon honey, and 1/8 teaspoon cinnamon. Blend until smooth. • Lemon-Garlic Grilled Salmon: Combine 1 tablespoon soy sauce, 1 tablespoon olive oil, 2 teaspoons fresh minced ginger, 1 teaspoon chopped garlic, and ½ teaspoon grated lemon zest. Marinate a 5-ounce salmon fillet in this mixture for 30 minutes. Grill until fish flakes easily. • Sweet Potato Delight: Cut 1 baked sweet potato in half lengthwise. Top with 2 tablespoons walnuts, 2 tablespoons mini marshmallows, and 1 tablespoon semi-sweet chocolate chips. Broil 6 inches from heat, until marshmallows are golden brown. • Top 1 cup nonfat yogurt with ½ cup sliced strawberries, ¼ cup diced kiwi, and 2 tablespoons bran. • Sardine Sandwich: Combine 2 tablespoons nonfat sour cream, 1 tablespoon Dijon mustard, 1 teaspoon snipped dill, and ¼ teaspoon grated lemon zest. Spread mixture on two pieces pumpernickel bread and top with 2 tomato slices, 2 slices red onion, and 4 cucumber slices. Top each half with 3 canned sardines. • Watercress Salad: Combine 2 teaspoons olive oil, 2 teaspoons orange juice, 1 teaspoon mustard, and a ½ teaspoon honey. Toss with 2 cups watercress. • Tuna with Corn Salsa: Combine ½ cup frozen corn kernels, thawed; ½ cup canned black beans, drained; and ¼ cup roasted red peppers, chopped. Add 1 teaspoon orange juice, 1 teaspoon olive oil, and 1 teaspoon chopped cilantro. Season 5 ounces of fresh tuna with salt and pepper. Grill or broil 4 inches from heat for 6-8 minutes. Top with corn salsa. • Spinach Salad: Combine 2 teaspoons chopped onion, 1 tablespoon olive oil, 2 teaspoons balsamic vinegar, and 1/8 teaspoon poppy seeds. Toss with 2 cups torn spinach leaves. • Old-Fashioned Baked Apple: Place 1 Granny Smith apple, cored, in a small baking dish. Fill hole with 2 tablespoons raisins, 1 tablespoon chopped walnuts, and 1/8 teaspoon cinnamon. Pour 1 tablespoon orange juice in bottom of baking dish. Cover. Bake at 350 F until tender. Top with nonfat vanilla yogurt. • Shrimp Salad Pita: Combine 5 ounces cooked shrimp, chopped, with 1 tablespoon mayonnaise, 2 tablespoons diced celery, ½ teaspoon snipped dill, ¼ teaspoon grated lemon zest, and 1/8 teaspoon chopped garlic. Fill 1 whole-wheat pita with shrimp salad mixture and 1 cup watercress. medium; add pork, 2 tablespoons balsamic vinegar, and 2 tablespoons chicken broth. Cover. Cook 8-10 minutes. • Savory Pumpkin Puree: In a small saucepan, mix ½ cup canned pumpkin puree, 1 tablespoon chicken broth, 2 teaspoons honey or sugar, 1/8 teaspoon cinnamon, and 1/8 teaspoon grated fresh ginger. Cook, stirring, 5 minutes. • Cheesy Cauliflower: Steam 2 cups cauliflower florets until tender. In a medium bowl, toss cauliflower with 1 tablespoon grated Parmesan cheese, 1 teaspoon olive oil, ¼ teaspoon grated lemon zest, a pinch of salt, and a pinch of cayenne. • Peanut Butter and Honey Crunch: Stir 2 tablespoons of peanut butter in 1 cup nonfat yogurt. Sprinkle with sunflower seeds. Drizzle with honey. • Honey Raisin Oatmeal: Cook 1 cup oatmeal in 2 cups nonfat soy milk, rice milk, nut milk or nonfat milk. Mix in ¼ teaspoon cinnamon and 2 tablespoons raisins. • Salmon-Chickpea Salad: Crumble 4 ounces cooked salmon over 1-1/2 cups baby greens and ½ cup cooked chickpeas. Toss with ½ tomato, diced; ¼ red onion, diced; and ½ teaspoon chopped fresh mint. Toss again with 1 teaspoon olive oil and 1 teaspoon cider vinegar. • Garlicky Pesto Pasta: In a blender, finely grind 1 teaspoon pine nuts and a pinch of salt. Add ¼ cup packed basil leaves, ¼ cup packed parsley leaves, and 1 clove garlic, peeled. Blend well. Add 1 tablespoon olive oil and process until smooth. Add 2 teaspoons grated Parmesan. Blend well. Toss with 1-1/2 cups cooked, warm whole wheat or high protein (lentil) pasta. • Pepper-Tomato Salsa: In a large bowl, combine 1 cup diced red, yellow, or orange bell peppers; ½ tomato, seeded and diced; ½ tablespoon lemon juice, ½ tablespoon chopped fresh green chilies, ½ tablespoon minced cilantro, 1 teaspoon minced onion, and ½ tablespoon balsamic vinegar. Let stand one hour. • Tropical Sundae: Top 1 cup diced mango with a dollop of nonfat yogurt, flavored with 1 teaspoon vanilla extract and 1 tablespoon honey. Sprinkle with 2 teaspoons chocolate chips and 2 teaspoons crushed walnuts. • Top 1 whole grain frozen waffle with ¼ cup blueberries and ¼ cup sliced strawberries. Sprinkle with cinnamon. • Pepper-Garlic Pizza: Drizzle one 5-inch whole grain prepared pizza crust with ½ teaspoon olive oil. Spread ½ cup seasoned tomato sauce over crust. Top with ½ cup sliced red or yellow bell pepper, 2 tablespoons chopped onion, ¼ teaspoon minced garlic, 1/8 teaspoon dried basil, 1/8 teaspoon dried oregano, and ¼ cup shredded part-skin mozzarella cheese. Bake in 350 F oven until cheese bubbles. • Banana S’More: In a microwave-safe bowl, cover 2 graham crackers with 1 sliced banana. Top with 2 tablespoons mini-marshmallows and microwave on high for 30-second intervals until marshmallows begin to melt. Drizzle with 1 tablespoon chocolate syrup or sauce. • Lentils with Couscous: In a medium saucepan over medium-high heat, combine 1 cup cooked red lentils with ½ teaspoon olive oil, ½ teaspoon minced fresh garlic, 1/8 teaspoon turmeric, ¼ teaspoon grated lemon zest, 1 tablespoon chopped onion, and 1 tablespoon chopped celery. Heat through and toss with 1-1/2 cups cooked couscous. • Fruit and Yogurt Parfait: In a small glass, alternate ½ cup nonfat yogurt (flavored with 1 teaspoon vanilla extract and 1 tablespoon honey) with ¼ cup sliced kiwi and ¼ cup diced pears. Top with a dollop of nonfat yogurt and 1 tablespoon slivered almonds. Cavanaugh, Christopher (Editor-in-Chief). Strengthen Your Immune System. 2001. The Reader’s Digest Association, Pleasantville, NY.